A kitchen is one of the places in our homes where we have a large number of appliances. With technology advancement, gone are the days of manual grinding and chopping. This means an abundance of kitchen appliances for cooking, baking and prep work. 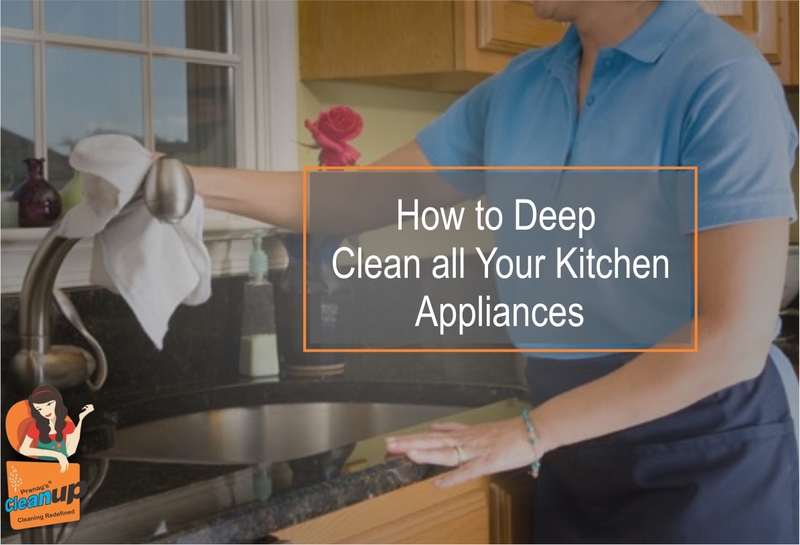 Cleaning these appliances can be a tiresome job especially when they are often overlooked during the cleaning spree) In this guide, we’ll share cleaning tips and secrets to tackle all of these appliances together in a manner that will not only save you hassle but also time, money and energy. a) Empty the freezer. Get rid of any expired and stale food. Sort the remaining items into perishable and non perishable categories. b) Take out all the detachable parts and trays. Soak them in tub or plugged sink with warm soapy water. Take a couple of sponge wipes and wipe the sides and interior of the fridge with a good quality non-toxic cleaner. Don’t forget to wipe the exterior and handles. c) Clean the detachable parts and trays. Dry them and put them back in. Add shelf liners that easily be changed or cleaned periodically in case of spills and prevent scratches on your trays. d) Restock your fridge. Deodorize your fridge with a cotton ball soaked in vanilla essence or rose water or simply slice a lemon and let it sit in fridge door or tray. You can leave it there for more than week to keep your fridge smelling fresh and fragrant. b) Take out the shelves, trays and any other detachable parts. Soak them in warm soapy water. c) Take a good cleaning solution or use vinegar and baking soda to wipe the interiors. Place a warm soaked towel on any difficult stains or grime. Let it sit for a few minutes and then gently scrub it clean with a green scrubber pad. Take note to clean the exterior and any buttons. d) Clean the detachable parts and place them back. a) Clear away the crumbs by gently wiping the plates. b) Take out the plates and removable grills and let them soak in warms soapy water to loosen the grease. c) Wipe the interior and exterior of the appliance with a non-chemical cleaner. Use a crumbled aluminium foil to rub off any rust. d) Clean and replace the detachable parts. a) Remove any blades and removable parts. Soak them in warm soapy water. b) Wash the jars and take a toothbrush to clean the fine residue around and below the blades. c) Clean all the parts and make sure to dry them to prevent any rust. d) Wipe the exterior of electric component of the appliances. Take special care to clean the turn nozzles for speed and settings. Spray the stove top with an all-purpose cleaner and let sit for a few minutes. For tough stains, place a warm soak towel on the stains or apply a paste of vinegar and baking soda and let it sit for a few minutes to loosen up. Gently scrub away the grease and grime. Wipe it all dry. For any metallic burner stands, let them soak in water and then scrub clean with a stainless steel scrubber. We tried to capture all the common appliances in this guide. If we missed something, let us know in the comments and we’ll address it in another article. Also check out our article: 5 Step Deep Cleaning for the Kitchen. Happy Cleaning.